The 2018 Guitarist, Acoustic Guitarist and Young Guitarist of the Year competitions are in full swing. You can enter now by shooting a video of your playing, uploading it to YouTube and sending us the link using the form below. 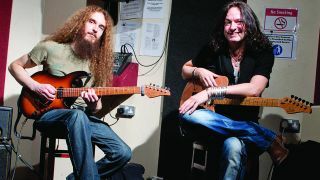 If you manage to impress our panel of star judges then you could be following in the footsteps of past Guitarist of the Year entrants including Guthrie Govan and Dave Kilminster. Guitarist of the Year isn’t a new concept. In fact, current Guitar Techniques editor Neville Marten launched the Guitarist of the Year competition as editor of Guitarist way back in 1991. Entries were submitted on VHS tapes! Dave Kilminster won the first year with his tune ‘Sundance’, which was an incredible piece and made him the undisputed winner. Dave was the very last entrant but he blitzed the competition. From that he went on to teach at various London academies and also to write for Guitar Techniques, which he did for many years. He has been Roger Waters' guitarist since 2006, touring the globe with the Pink Floyd superstar. Guthrie Govan won the following year under David Mead's editorship. David wrote a melody that entrants were to use as the basis for their entry. That became Guthrie's popular ‘Wonderful Slippery Thing’. Guthrie also wrote for Guitar Techniques for many years, increasing his worldwide profile and helping to launch his wider career, which includes working with Steven Wilson and The Aristocrats. Other notable winners include sensational blues guitarist Paul Rose; Stuart Ryan who is now Guitar Techniques' acoustic columnist and head of guitar at BIMM Bristol; and Will McNicol, another fantastic acoustic guitarist who won, alongside James Bell at the reinstated competition in 2011 under Mick Taylor (Will has released four critically acclaimed albums and is a busy top-flight player, while James is currently signed to management and working on various projects). Notable entrants include Fraser Thorneycroft-Smith who went on to work with Craig David, James Morrison and Adele (writing and playing on ‘Set Fire To The Rain’), and producing Stormzy's number one album Gang Signs & Prayer; and Paul Garthwaite the extraordinary and unique multi-stringed instrument player who uses, among others, an incredible 22-string monster built by Andy Manson.